Acupuncture is often only thought of as a way to treat ongoing pain. While it is very useful in this area, there are many other conditions that can be successfully controlled and/or treated using acupuncture. Currently, there is a large amount of research being done to determine why acupuncture works. If is known that stimulation of an acupuncture point affects the nerves in that area. This in turn can influence areas throughout the body through the release of chemicals that affect the brain, including endorphins, the body's natural "pain killing" hormones. Acupuncture will also stimulate circulation, relieve muscle spasms and stimulate the body to bring the regulatory mechanisms back into balance. It is important to note that a full medical workup is recommended to determine the best treatment for your pet. Acupuncture is not a "cure-all" but can often be used in conjunction with other treatments. Please speak to your veterinarian regarding acupuncture treatment. 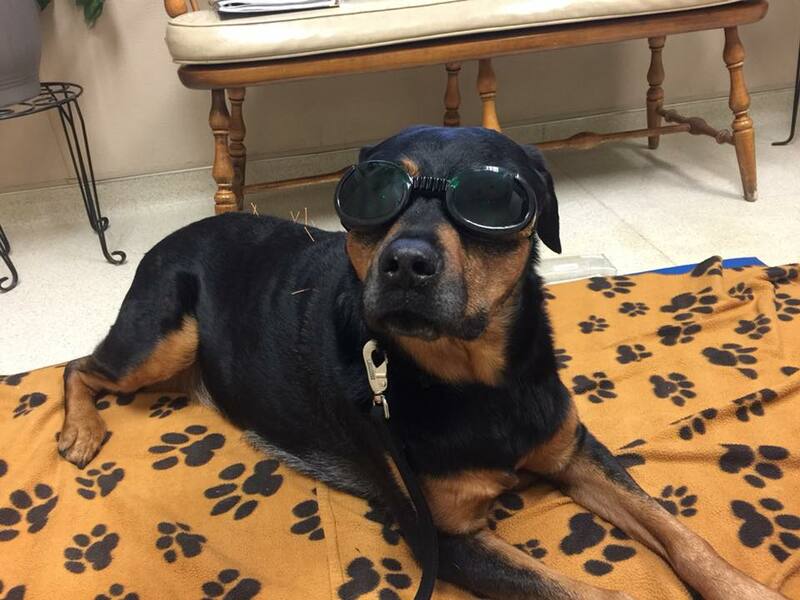 Sampson is seen here having an acupuncture treatment as well as a laser treatment! Acupuncture and Laser work really well together. 1. What conditions are most commonly treated with acupuncture? Control of pain- e.g. glaucoma, dry eyes, arthritis, cancer pain, neck and back pain, release of trigger points. Skin diseases- e.g. chronic ear infections, dermatitis, autoimmune conditions. Immune disease- inflammatory bowel disease, joint disease, bronchial disease. Diseases of the eye- dry eye, pain control. Depression, stress related mental disorders. Digestive- nausea, diarrhea, vomiting, abdominal pain, ulcers, movement of the GI, disease of the bile duct and gall bladder, decreased appetite. Urinary diseases- inflammation of the kidney, bladder, prostate and/or urethra, incontinence. 2. How will my animal react? Does it hurt? Acupuncture if performed with individually wrapped sterile, stainless steel needles that are disposed of after each use. There is sometimes a reaction, either a twitch or a look from the animal when the needle is inserted through the skin. Once the needles are placed, the animal will usually relax and sometimes even fall asleep. 3. What is the treatment schedule with acupuncture? The initial visit will generally be about 45 minutes, a thorough history is taken and physical exam performed by Dr. Grove. We will discuss your expectations and design a treatment plan together, depending on the severity of the disease and response to treatment. Generally, we recommend 1-2 times per week for the first several weeks, decreasing to 1-2 times per month. Sometimes animals can be maintained on treatments every 6 months. Each treatment is based on the needs of the individual patient. 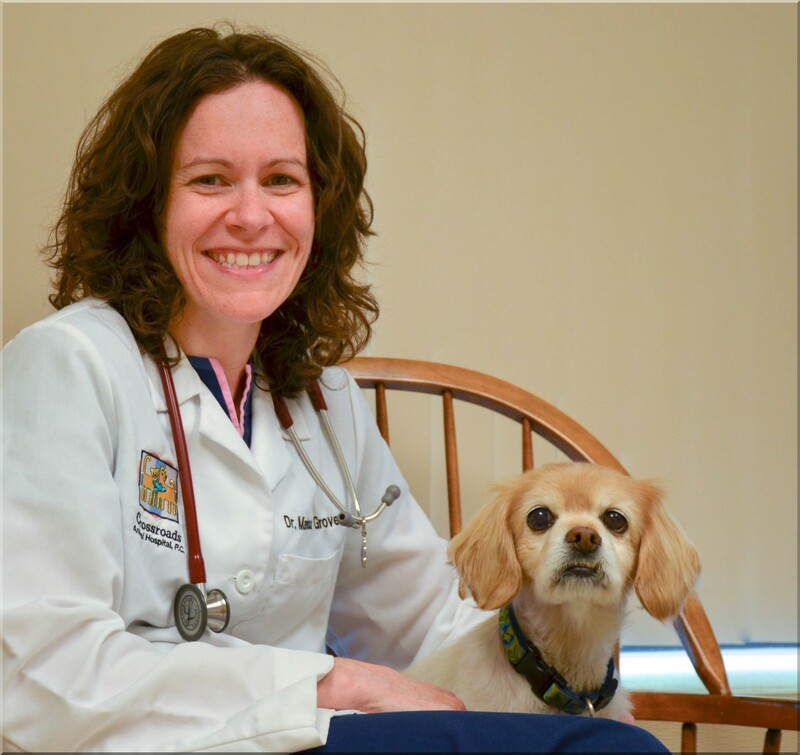 Dr. Grove was trained by the American Academy of Veterinary Medical Acupuncture in Fort Collins, CO. She started to develop an interest in acupuncture due to the increase in awareness of complementary treatment in veterinary medicine. Through her training she was able to see a significant response in her animal patients where other treatments have failed. She hopes acupuncture will help owners and their pets live happier, healthier lives.